Most dog owners want their dogs to protect them. It’s one of the benefits of owning a dog. But it does need a certain level of dog aggression to be present in your dog. And so it’s vital that this aggression is only seen at appropriate times. The problem is that dogs often find it difficult to know when it’s right to display aggression. And this can lead to dogs displaying aggressive behavior when it’s inappropriate. Which is something you want to avoid, of course. So let’s take a look at the most common causes of dog aggression. We’ll also consider some proven strategies for stopping dog aggression when it’s inappropriate. Aggressive behavior in dogs can be hereditary. It can also be the result of the dog’s environment and upbringing. And poor health can cause dog aggression too. Hereditary aggression is unlikely to ever be the root cause of aggressive behavior in a pet dog. This is because it’s not in line with the concept of animal domestication. A more likely cause of dog aggression is poor health. In particular, physical pain or discomfort often causes aggressive behavior. In such cases, the aggression is a health problem rather than a behavioral problem. Even more likely to cause aggression are misunderstandings or the dog’s environment and upbringing. Aggression is a natural behavior that is necessary for a dog’s survival in the wild. Lack of proper obedience training and socialization early on in the dog’s life. Also, a dog owner may encourage aggressive behavior without realizing it. They invite repeat displays by rewarding dog aggression without even knowing they’re doing so. Dog aggression aimed at owners may be a result of there being no pack leader established. The dog’s likely trying to become the pack leader because it senses that it has a real chance of doing so. Dogs like to know where they stand in the pecking order. Showing your dog that you are the one in charge will help stamp out aggression directed towards you. You can read more about how to become pack leader here: How To Be Pack Leader. Baring teeth and engaging in a stare-down. Looking alert, with whiskers, and ears pointing forward. Tail up in the air, standing tall. Dog aggression issues are best solved by considering the triggers of aggression. This means understanding the aggression in the context of various natural drives. That is prey, pack, and defense (fight or flight) drives. Each drive has its own set of triggers. So the best approach to take to stop dog aggression depends on which drive is the cause of the aggression. Having said that, understanding your dog’s personality is vital. It helps you predict how they’ll react in any given situation. And this in turn helps you manage all dog aggression situations. A common cause of dog aggression results from a dog’s drive to hunt and kill prey. Prey drive aggression is the most dangerous type of dog aggression. This is because so many different stimuli can trigger it. Sounds, smells, and moving objects can all be triggers. Moving objects includes cars, bikes, joggers, and other animals. The real problem begins whenever the dog catches up to the stimuli. To manage aggression related to prey drive, ensure that your dog gets plenty of exercise. A great way to do this is by playing retrieve games. And if your dog gets distracted while out walking, try to direct their attention back to you. Then walk the other way. A simple command of “Leave it” may be enough to return his attention back to you. If not, you can use a quick leash check to reinforce the verbal instruction. It’s important not to let your dog loose in situations where they might run away from you. The best thing you can do is to train your dog to come on command every time. You should never let your dog give chase to cars or people jogging or biking. Pack drive relates to a set of behaviors associated with being part of a group. Particularly important are behaviors related to the struggle to increase status in the pack. Increased status means increased opportunities for reproduction. Aggressive behavior directed at people. Aggression directed towards other dogs, even though there is no clear reason for it. Not ending the attack when the other dog submits. Pack drive aggression is often seen when you remove dogs from their mother and litter too young. A puppy learns to inhibit its tendencies to bite when it’s about 5 to 7 weeks old. The same is true for learning how to understand dog body language. If a puppy hasn’t learned these lessons they may be aggressive to others. They may also be too protective of their human owners. If a dog is not socialized before the age of six months, this can also lead to aggressive pack drive behavior. If the problem is that your dog isn’t well socialized with humans get them used to other people. This is easy to do. Just invite friends and family around. The problem of aggression towards other dogs is not so easy to fix. The most effective cure in the short term is prevention. Make sure you keep your dog on a leash so they don’t have the opportunity to bite other dogs. Introduce your dog to other dogs over time. And take great care to keep your dog under control early on in the process. A great tool that a lot of dog owners say helps to keep their aggressive dogs calm is oil of lavender. Oil of lavender induces a peaceful state in dogs that otherwise have aggressive tendencies. Dab a small amount on a tissue, and apply it to your dogs muzzle and around the nose. The defense drive consists of both fight and flight behaviors. It comes from a dog’s natural survival instinct. The defense drive is more complex as the same trigger can result in different behavior. That is, either aggressive behavior (fight) or avoidance (flight). A dog will often place their head over the shoulder of a rival dog. This is a classic sign of fight aggression. The dog who has the lower rank will drop his body down to signal that he recognizes that the other dog has a higher status. If both dogs see each other as equal in rank, then a fight may break out. A real dog fight is a frightening and scary experience. To prevent one from occurring you need to learn how to recognize the signs and keep the dogs apart. Approaching your dog in a threatening way. Making your dog get off the couch. Removing an item from your dog’s mouth. Getting close to another dog displaying an aggressive posture. An owner maintaining too tight a leash on a dog may cause a dog fight without realizing it. A taut leash causes your dog’s body posture to become upright. This is often interpreted as a sign of aggression by other dogs. So when getting close to another dog, maintain a loose leash. If a dog’s growl or body language suggest a fight might start, bring your dog to heel and head for safe territory. Calling your dog in a friendly manner helps here. This is because it helps change your dog from defense (fight) drive to pack drive. It’s important to give your dog lots of opportunities for exercise as well as training. Training tires the brain, while exercise tires your dog physically. You can play tug-of-war several times a week. This gives the dog a chance to use up his urge to growl, tug, and bite. If your dog is aggressive and you’ve got a real fear they’ll bite you then you’re not in control anymore. In this case a muzzle is the answer. It’s quite possible that you also need the help of a professional dog trainer. You can give yourself peace of mind when taking your dog out in public by using a muzzle. But keep in mind that a muzzle is a last resort. While it’s useful in the short-term, your long-term focus should be on stopping aggression. Professional trainers can be a big help in achieving this. Fear for their safety motivates ‘fear biters’ to lash out. Whenever this type of dog feels trapped and unable to escape the situation, it’s likely they will try to bite. Biting to them is a last resort, and they’d much rather get away from the situation. The best method for helping your dog to stop fear biting is to not put them in such a position. So avoid situations where your dog feels like their only choice is to bite. A dog that has strong flight drive may seem shy when around strangers. The same is true when around other dogs, or in situations they’re unfamiliar with. If your dog tries to hide behind you, be sure to keep them a good distance away from the cause of their distress. What this dog requires is an environment that’s predictable and structured. And also a training schedule that incorporates a good deal of confidence building. Keeping a daily schedule for walking, feeding, and playing with your dog will help. Training with encouragement is a great way to increase self-confidence in a dog. You can also try enrolling your dog in a dog obedience class to help them get used to people and other dogs. Don’t start shouting and screaming, it will only make the dog fight worse. You should give your dog the choice of fending for themselves or retreating. So let go of their leash. Don’t try to separate the dogs, or one of them may bite you. Be patient and wait until one of the dogs gives up. Find out who the loose dog belongs to and take action. Your dog may start to growl if you get too close to its food bowl. Guarding food is an instinctive reaction that’s actually quite common among dogs. It’s not something to be particularly concerned about. Some owners make this behavior worse by trying to take away the food bowl while a dog is eating. This isn’t a good idea and tends to makes the problem worse. To stop feeding aggression, make sure you feed you dog somewhere no-one else can get to their food bowl. A good place to feed a dog is inside a crate. Feeding inside a crate or other quiet location means that your dog can eat in peace. 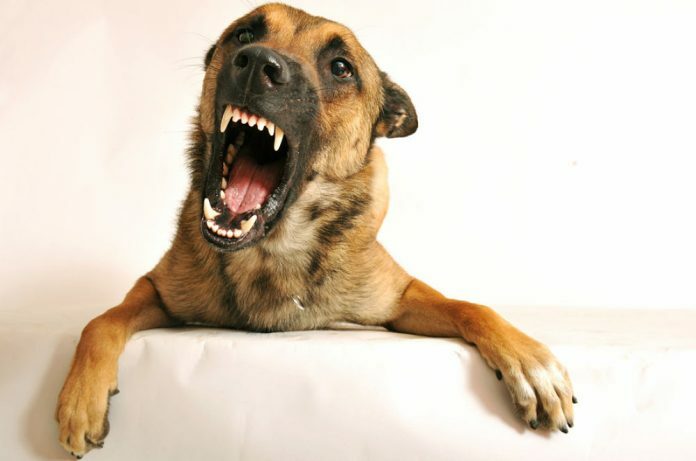 A certain level of dog aggression is needed if you want your dog to guard and protect you. But it’s important that your dog learns when, and when not, to display that aggression. With a good understanding of why your dog shows aggression, you can start to control it. The strategies discussed in this article will help with this.